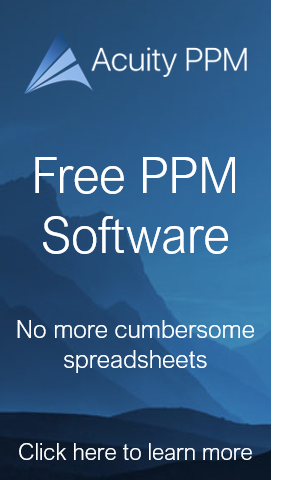 In both the PPM literature and portfolio tool brochures, one would be led to believe that the application of the efficient frontier will provide the final answer of which projects to select. While doing more research on efficient frontier techniques, I started considering the work that still needs to be done once an ‘optimal’ solution has been developed that maximizes value under current constraints. Unless skill sets are included in the optimization, more time will be needed to determine if resources are available to execute the “optimal” portfolio. Additionally, the efficient frontier does not help with project sequencing, therefore further analysis will be required to properly sequence the ‘optimal’ portfolio. This is not to say that the efficient frontier technique should not be used, only that it still takes a little more time to complete the optimization exercise once the ‘optimal’ list of projects have been selected. In fact, the efficient frontier approach can actually save management a lot of time and discussion by pointing to a set of projects that delivers maximum value for a particular level of spending. Instead of fighting for what should be included, the discussion can be focused on those projects that bring the portfolio off of the efficient frontier (such as mandatory projects that don’t provide much value). To use a golf analogy, using the efficient frontier will not give you a ‘hole in one’, but it will get you to the putting green nearly every time in one stroke. Every golfer would like that.